Markus Linnenbrink was born in Dortmund, Germany in 1961, where he still lives and works. His artwork ranges from pantings and sculpture to larger-scale site-specific pieces. He has just created a new series which includes three types of work: drip paintings, drill paintings and sculptures. 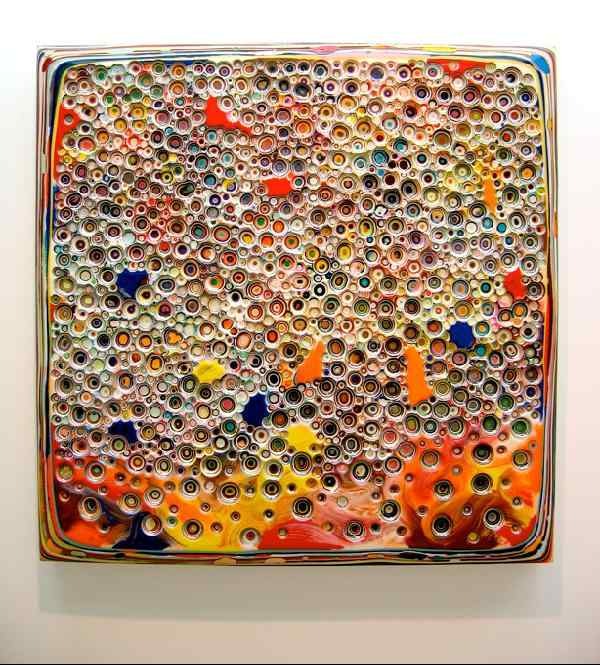 In each, Linnennbrink uses epoxy resin with pigment and gravity as vehicles to explore color and depth. 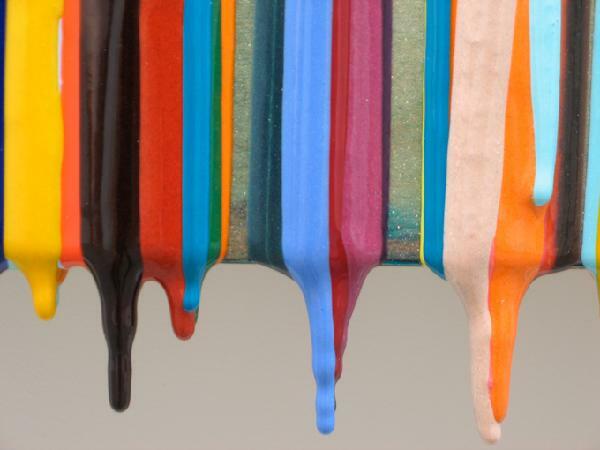 The drip paintings are most directly affected by gravity. The process is extremely toxic and messy. Linnenbrink uses a respirator and chemical-safe suit. Resin is poured from the top of a piece of wood which is covered with watercolor paint. Gravity then takes control. The resin material produces ridges which create texture as it moves down the wood. Once dried, the finished painting is translucent in some areas showing the muted watercolor from underneath. This gives the viewer a sense of depth. At the bottom of the painting, the last bit of resin to take hold on the wood appears ready to drip off. Linnenbrink's sculptures are created in plexi-box molds. In fact, he places these boxes below the drip paintings to catch the excess resin. Once one color dries he moves on to the next. These serve as a history of the drip paintings. 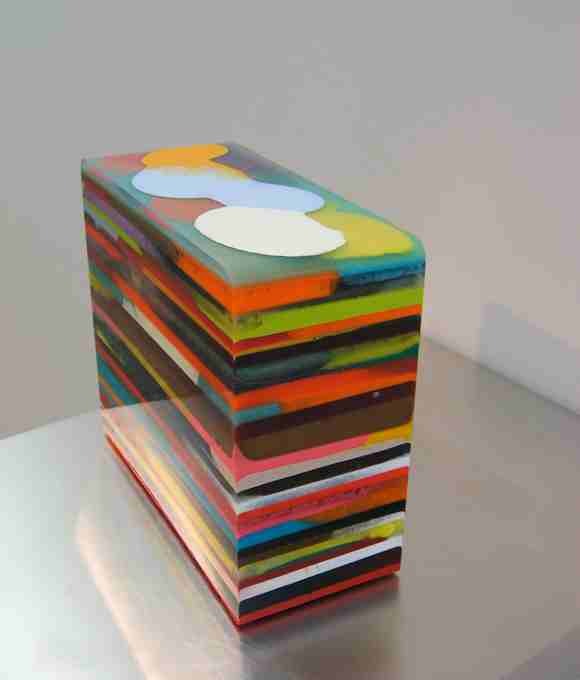 After many layers of material drip into the box he strips away the plexi and a rectangular sculpture is left. 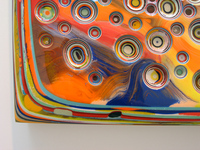 A horizontal contrast of colors is revealed with several pancake-shaped discs on the top reminding the viewer of the pouring process. The drill paintings, true to their name, actually entail Linnenbrink using a drill to create an effect of depth. He first tapes around the edge of the frame. 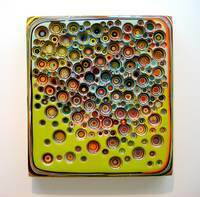 Then, he pours multiple layers of different colored resin and builds the surface to nearly a half-inch thick. At the end of the pouring process he finishes the surface with a dominant color. Then comes the drilling. He creates recessed bubbles into the surface at different depths. Each 'bubble' reveals different colors (see detail). Both the pouring and drilling phases are extremely calculated and intuitive. 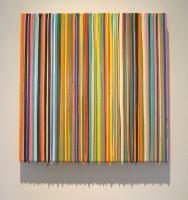 Linnenbrink's paintings and sculptures for his next show are currently being previewed. The show will likely sell out before it opens on September 6th. The body of work includes three small sculptures (roughly 10x10x5), seven drip paintings (the largest is 54x97), and seven drill paintings (up to 60x60). Several pieces out of the 16 works are still available. The sculptures start at $5,000 and the largest painting is $30,000. There are a number of pieces priced below $20,000.